Director Robert Altman poses with two of the stars from his Cookie's Fortune, Glenn Close and Liv Tyler. The 1999 edition of the Sundance Film Festival kicked off with the premiere of Robert Altman's Cookie's Fortune, a comedic and suspenseful drama about small town Southern life. At the film's premiere Sundance president Robert Redford praised Altman's long, non-mainstream Hollywood career, saying, "When one thinks about the definition of independent film and what it means, in my mind, there's no greater example of that than Robert Altman." At a press conference for the film the next morning, Altman acknowledged that he and the film were selected for Sundance to draw media and public attention which could then be channeled to the lesser-known and unknown filmmakers at the fest. "It's for the filmmakers whose names you don't know yet." Altman further explained, "Years ago when M*A*S*H went to the Cannes Film Fest, that empowered me and now I have the obligation to pass that on to new filmmakers." 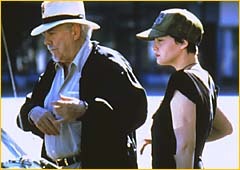 Robert Altman's directs Liv Tyler in Cookie's Fortune. When asked about the up-and-comers, however, the veteran filmmaker said, "We're all jealous as hell because the stakes are so high and the competition so fierce." Joining Altman at the press conference were many of the stars of Cookie's Fortune, including Glenn Close, Liv Tyler, Charles S. Dutton, Patricia Neal, Lyle Lovett, Courtney B. Vance, Matt Malloy (In the Company of Men) and Niecy Nash. The film's screenwriter Anne Rapp said she'd "tried to write a piece about family pride - its pitfalls and how it can save you, too." Cookie's Fortune marks the fourth time Lyle Lovett has appeared in an Altman film. He praised Altman saying, "The understanding of human nature he demonstrates always wakes me up." 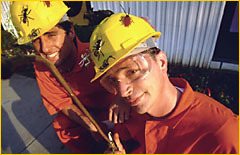 When asked if he hoped to combine his acting and music careers, Lovett deadpanned, "I hope to keep a job of some kind." Redford talks to the filmmakers at annual Sundance brunch. 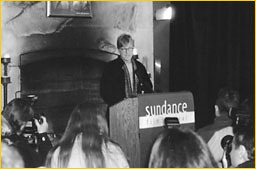 The following day Robert Redford hosted his annual filmmakers brunch at the Sundance Institute. He dispensed with his usual pre-brunch press conference and spoke directly to those assembled in the large rehearsal hall. Standing in front of a large fireplace, he first apologized for not being able to visit with each filmmaker one-on-one, but said, "We didn't have the time and your focus is on your film and how it will be received." He then recounted the evolution of Sundance in four steps. First was the formation of the Sundance Institute in 1981. The impetus for the Institute was Redford's observation that the film community seemed to be eroding. "I tried to put something in place to make it easier for filmmakers...where they can explore and develop their ideas with other filmmakers in a free atmosphere." This led to the second phase, a showcase for the films coming out of the Sundance Institute labs. In 1985 Sundance took over the management of the U.S. Film Festival in Park City and eventually re-christened it the Sundance Film Festival. "We didn't have a market in mind, but the outgrowth of the film festival is it became a market." Redford isn't entirely opposed to the commercial aspect now present at Sundance. "I'm fine with it. It's tricky, but it's okay because it creates benefits for filmmakers. But there are some dangers. You can get hurt, disappointed and depressed when hit by the merchant mentality of distribution." The third stage in the Sundance expansion was the Sundance Channel, which came about, says Redford, because "there was a clogging in distribution, so we went the way of television, creating a twenty-four hour a day, 7-day-a-week opportunity to see these films. But not content to settle for cable exhibition only, Sundance expanded to a chain of movie theatres, which will be opening later this year. Redford wants the Sundance Cinema Centers to "go beyond the cookie cutter moviegoing experience of getting in and out, instead creating a filmgoing community." The theatres will be designed as gathering places for film lovers and include libraries, bars and other amenities. They will reserve screens for independent films, documentaries and shorts. Redford said, "I personally believe documentaries should receive the same exhibition as mainstream films" and promised that the theatres will include a "basement experience for the taboo, experimental films you're not supposed to see." Luke Wilson and Joshua Malina star in Kill the Man. Funniest Film: Hands down it's Kill the Man, in which two friends who own a small copy shop plot to take down "King Co." the mega-copy franchise across the street. Priceless. Scariest Film: The Blair Witch Project takes the horror genre to new heights, not through blood and gore, but a clever premise that pays off in a genuinely chilling experience. Darkest Film: Tim Roth's directorial debut, The War Zone, a thoroughly depressing film which Roger Ebert picked as his favorite film at Sundance. Most Buzz: Happy, Texas drew raves from Park City audiences and then a bidding war (see "The Deals" below). A very funny film about two prison escapees forced to impersonate a gay couple who coach child beauty pageant hopefuls. Gregory Nava was honored at Sundance. Most Deserved Tribute: The Oscar-nominated El Norte was the first film to come out of the first Sundance lab and was selected recently for the Sundance Collection at UCLA, a living archive for independent film created to preserve, conserve and protect independent film for the next generation. El Norte's director, Gregory Nava (who has just entered a two-year production deal with New Line) attended this year's fest where his 1984 masterpiece received a special screening. It will be re-released by Artisan Entertainment this fall. Best Performance: A five-way tie for the standout performances given by Noah Fleiss in Joe the King, Brian Cox in The Minus Man, Janet McTeer in Tumbleweeds, Steve Zahn in Happy, Texas and Jean Smart in Guinevere. About young Noah's performance, first-time director Frank Whaley said, "Noah wasn't at all physically right for the part, but he's a totally instinctual actor and I had to cast him." Jack Kerouac, Allen Ginsberg and William S. Burroughs in Chuck Workman's The Source. Best Documentary: Award-winning filmmaker Chuck Workman delivers the goods in The Source, an examination of the cultural evolution from Bohemia to Hippiedom and beyond. Fascinating new and archival footage from major figures in the Beat Generation with special focus on Allen Ginsberg, Jack Kerouac and William Burroughs. Three Seasons made Sundance history by being the first film to capture both the Grand Jury Award and Audience Award in the dramatic competition. It was also the first foreign language film to win either of those prizes and the first American film to be shot in Vietnam since the war. Three Seasons is the debut of director Tony Bui who developed the project at the 1996 Sundance Lab. Lisa Renzlar received the Best Cinematography (Drama) Award for her hauntingly beautiful images in this picture about an American (played by Harvey Keitel--the only non-Vietnamese actor in the film, and also the executive producer) who returns to Vietnam in search of his daughter. Three Seasons will be released in the U.S. in April. Sarah Polley and Stephen Rea in Guinevere, co-winner of the Waldo Scott Screenwriting Award. The Grand Jury Award for Best Documentary went to Chris Smith's American Movie, which documents a mid-western, low-budget filmmaker's two-year quest to finance his dream picture. The audience favorite for Best Documentary was Roko Belic's Genghis Blues, which chronicles a blind blues singer's fascination with the ancient art of Tuvan throat singing. Regret to Inform, which presents testimonials by both American and Vietnamese women who lost their husbands in the war, won two awards in the Documentary Competition--Best Director for Barbara Sonnenborn and Best Cinematography for Emiko Omori. Illeana Douglas in Happy, Texas. The big story was Happy, Texas. Once rumored to have fetched a $7 million distribution deal, when the bidding war dust had settled, the filmmakers had accepted $2.5 million and an unheard-of percentage of the profits from Miramax. The Blair Witch Project was picked up by Artisan Entertainment for about $1 million. Allison Anders and Kurt Voss' Sugar Town went to October Films for $1.25 million. Ally Sheedy stars in the film and describes it as "about people around age forty trying to function in a youth-obsessed Hollywood." Fine Line paid over $1 million for the Filmmaker's Trophy winner, Tumbleweeds, starring Tony Award-winner Janet McTeer. October acquired North American rights to Kill the Man for its genre division, Rogue Pictures. Twin Falls, Idaho, a film about conjoined twins, was picked up by Sony Picture Classics for $600,000. The Sundance Film Festival hasn't yielded any $10 million distribution deals since the purchase of The Spitfire Grill didn't pay off at the box office. But a new indie sales standard may have been set when Miramax agreed this year to pay the makers of Happy, Texas a percentage of the profits. Perhaps this is a precedent for deals to come at future fests.